Many thanks for entering the Mulberry Bush Montessori Balfron 10k, Balfron welcomes you! There will be car parking at the campus (G63 0PW), although as the car park exit crosses the race route, car park closes at 9:45 and cars will not be allowed to leave until the race finishes – and not before 12:30 at the earliest. 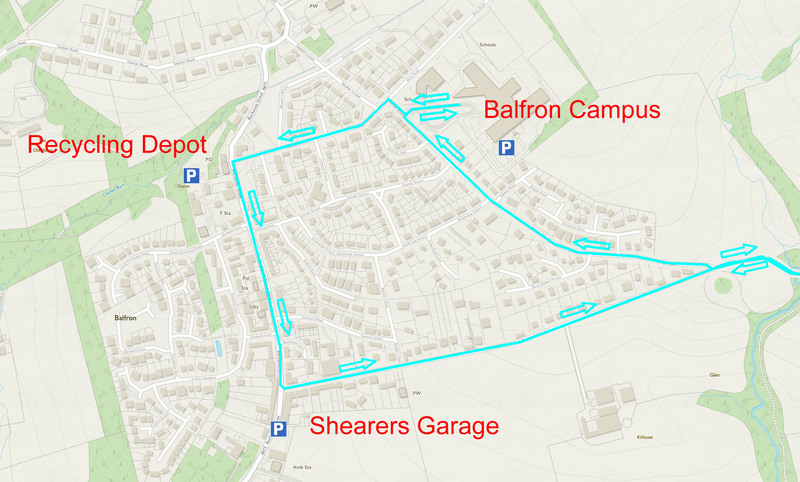 Alternative car-parking is available at Shearer’s Garage (G63 0RN) and the village recycling facility (G63 0TE) – all around 5 minutes walk away (see map below). Please DO NOT use the Golf Course car park. As always, parking is at own risk. Alternatively there is on-street parking available but we must stress again PLEASE DO NOT park on Roman Road, Cotton Street, Buchanan Street and Dunmore Street – as these form part of the race route! Please show consideration for local residents when parking – Balfron is not accustomed to so many visitors! Registration is open from 09:00 – 10:30 in the High School Sports Hall and race numbers with embedded timing chips and safety pins will be provided at this time. We have had a fantastic response to the race and have more than 500 entrants, so please come early to avoid a rush closer to the race start. The new route starts with a loop of the village before joining the original out and back route, following a straight road. The turning point will be clearly indicated and marshalled. There will be two water points on the route, at approx 4.4km and 6.7km. You will pass the return water point before the outward water point but please DO NOT cross the road – the outward water point is only 100m or so further on. Similarly on the return, you pass the outward water point approx 100m before the return point – again DO NOT cross the road. Only take water from the left hand side of the road. The route will be largely traffic free, although access to the few properties on the route cannot be denied, so there may be the occasional vehicle. Please keep left at all times. There are several speed bumps on the school driveway (close to the start / finish), Cotton Street and Roman Road. Please be very careful of these at the mass start, particularly as the first kilometre is all downhill and will be run at pace and at the finish when your legs are tired. Please be aware that once out of the village the route follows a country road, and that the surface can be uneven in places. Suitable precautions for safety have been taken by race organisers, but please remember you are responsible for your own safety at all times. St. Andrews Ambulance will be in attendance and offering First Aid cover as will Trossachs Search and Rescue. If you are experiencing any difficulties or concerns, please contact them or any of the race marshals – identifiable by their hi-vis jackets. Please do not compete if you are ill or injured.